Have been looking at the portage at Flamingo Key and thinking about what to do if you wanted to run with a class 4 row/sail boat. Figure that the appropriate rollers/ tackles are in the boat. How wide is the ramp going to the floats? What is the distance between the rails? There are boat ramps on both sides. You would not need to launch from the canoe docks. The ramp on the fresh water side is incredibly slippery! I haven't been here but wonder if there is a way to portage over the road on the right side of this screen shot? Or is the point to have a longer portage? That concrete bridge is a dam. ( big Croc's next to dam) If you have a light canoe you can probably portage at the consession floating dock next to the dam. There is another consession floating dock on te other side of the dam. Otherwise you'll need to follow the red line seen in the photo. 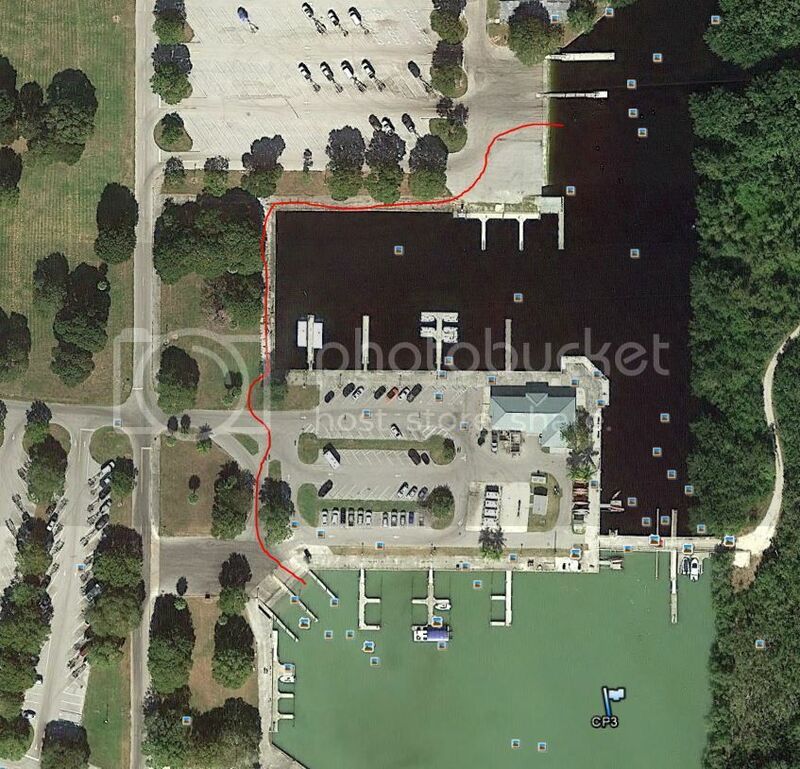 The red line on the bottom left ends at a couple of boat ramps( Floriday Bay) that are wide enough to launch 4 boats at one time. 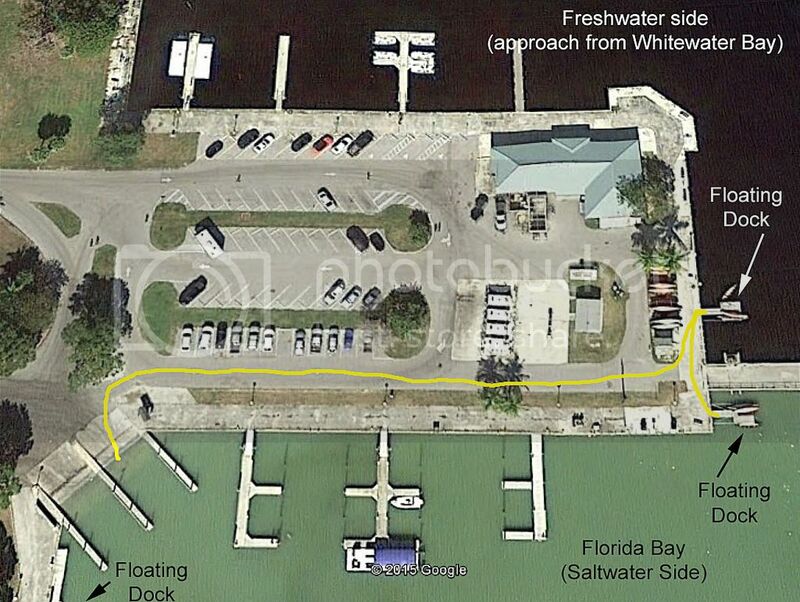 However, you will most likely need to use the floating docks on either side of the Florida Bay ramps. IN-MUNCH-CRUNCH-SATIABLE curiosity, but I couldn't find on net anywhere, and laying in bed too many nights now thinking about this very critical detail... How do the crocodiles go in and out of creek and bay at Flamingo with the dam in between and why does the answer matter? My one trip / 2014 doing the flamingo portage. I carried my gear by hand. In my attempt to save some time and effort carrying my boat, I took my boat out on the fresh water canoe dock, and put it back in on the salt water canoe dock. The docks where covered with canoes which made things difficult. I had to lay on the canoes, and reach down as far as I possibly could and grab my kayak. I was on the verge of falling it. It would have been nice to have somebody there to grab my feet. Esp as I knew there was a big crock close by. I stuck with the plan, just because I already paddled there and wanted to avoid the carry. Next time, I will do the carry if I see the docks are covered with canoes. Luckily my kayak weighs less than 45 pounds. I still have not decided if I will take a cart or not. I hate to carry it 300 miles to save walking back and forth 3 or 4 times. I like the idea of less weight, and more room in my boat. I like having more room every time I pack and unpack my boat. It is nice to have so much room, which makes the daily packing and unpacking faster and makes staying organized easier. Another factor is, if the winds and timing is right, the outside route could be desirable, and be nice helpful to avoid the portage. It is only an extra 6 miles to take the outside route & has a lot of nice camp sites along the way. On the other hand, my cart is very nice, and only weighs 3.25 pounds. It could get stuffed deep into the bow or stern and pretty much not be in the way. I figure I will likely decide at fort Desoto if it is going to make the cut. Has anybody else gone through the pro con analysis of bringing a cart or not? Has anybody decided they absolutely do not want to carry a cart, or feel absolutely they need to carry a cart? I would like to know your thinking. A cart is nearly a requirement. If alone and crashing before the final push you will make 2x trips. From the ramp to your stealth camp site, then to the ramp when you go. You also risk injury at a crucial time. I made this cart (1.2 lbs) which straps on the boat in the water. Saved my bacon twice. Busted Rudder has it together. It would be very upsetting to throw out my back at Flamingo. Its one reason I take things slowly. I will work on patching up the small cart Busted Rudder sold to me in 2014, that I stupidly broke pulling it over a hump at fort desoto. Its my job to test things to see if they will break. That was a stupid time to try and find that carts limits. BermudaBoy, the crocs are able to stay in the creek and never leave for the bay, since they have an over-abundant food source canoeing past daily. I agree, it is a drain to do the portage without a cart. Last time I had a partner, and it was not too bad. The time before that, it took me literally hours since I was so beat up. I went from floating docks NW of store, carried across parking lot to boat docks in saltwater. No canoes to avoid, but took many, many trips in the hot sun. Luckily they were open for ice cream! Oh, and watch out for the ravens. In 2013, I slid into the marina on the WW side after getting out on the boat ramp in ankle deep water without moving my feet after getting out of my kayak. Without moving a bit, I slid into chest deep water while holding my paddle with my paddle leash now pulling my kayak off of the concrete boat ramp and into the water with me and the friendly crocs. My shoes left two skidmarks as I slid standing upright wondering if the croc would get an arm or a leg first. Luckily, Sharkchow came running and grabbed my paddle to prevent me from slipping further into the abyss. I imagined pulling myself onto dry ground with only nubs of fingers left as I would have scraped my fingers to grip any bump in the concrete ramp that was covered in some amazing slime. Or my body would have been cut to bits to scramble up ong the oysters and barnacles on the concrete pier pilings alongside the boat ramp. And I had on good water shoes with good treads. These were not my Crocs, but nice paddling shoes that went for the ride into the deep! As clever as this group is...? All you need is a 2' or so? 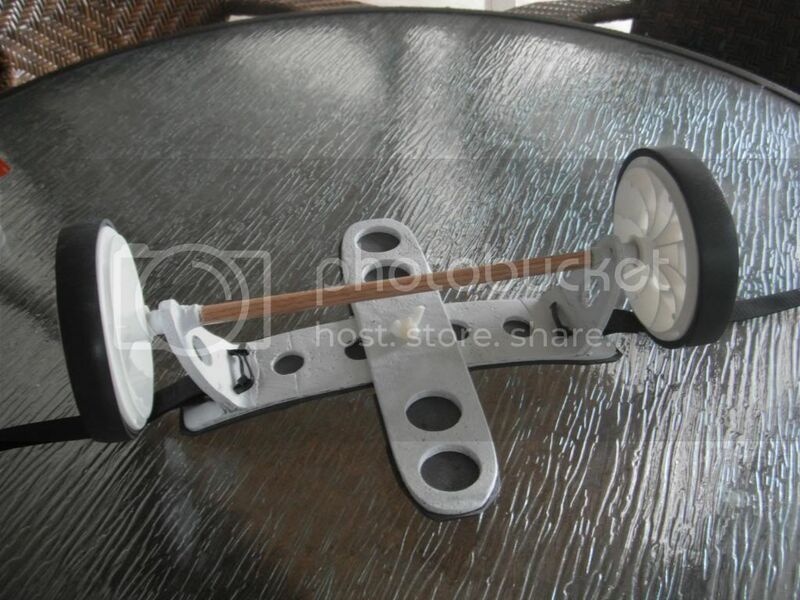 piece of broom stick and two small wheels of styrofoam press fitted on the stick. With a piece of rope that will reach from axel over the bow of the kayak. Pick up the aft end and start pushing. I will go into details if that is not clear. Try it in your drive way to get any kinks out. Ahh, Forgot the 4" piece of pvc pipe for a bearing at the center. I guess what I was really thinking was the feasibility of taking a class 4 row sail boat down the wilderness water way, which would be my motivation to give up skiing and iceboating in March in Maine. I guess I'd need to design an appropriate take apart cart as I don't think trailer ramp to trailer ramp would be possible given the distance. A bit of a challenge for a 17 foot 250 pound double ender. I know that Class 4 generally goes outside, but you don't get a shark tooth for that. What would he have been using for a cart? I've made them from 6" pvc and a wooden frame, but that is kind of big to carry even in a class 4. I guess I could rig it to bolt together Any more elegant ideas? Lots of ways to do kayaks and canoes but we have an order of magnitude larger boat. In 2014 I built a little lightweight cart for our Hobie TI, but it didn't even last through the last-minute home testing phase. So, as we were leaving Texas for Florida, I grabbed a couple 5" wheels and a piece of solid threaded rod. When we got to Flamingo by way of Whitewater Bay, I duct taped the rod to a boat cushion for a saddle and stuck the wheels on each end. It wasn't the best way, but we made it work. The distance, boat ramp to boat ramp, isn't really all that far. Hardest part was getting the boat onto the "cart" on the slippery ramp. At the time, I didn't know about the gators. Boat does have tent and mosquito netting so I could as I have done many times sleep in it. This all would be simple should I choose to take the old Nordkapp, but at my age I need to move around some. Based on my experience rowing the wilderness waterway, and looking at the pics of your very nice boat, here is my 2 cents. Many, many miles of the WW are wide open, crossing lake-like bays or coming down wide rivers, where sailing should be easy. There are some more narrow areas, where rowing may be a nice alternative for lack of fetch for the wind. There is one stretch, through Alligator Creek, where the width is not quite enough to get both oars in at once, as DWM alludes, but based on your photos you should be able to scull through that stretch if you want. And then there is the short stretch that everyone thinks of as the WW, because it is the true filter - the Nightmare and upper Broad Creek. You can avoid the Nightmare (I did due to tides) by sailing out Broad River and then coming up Broad Creek. All EC-legal. Right about where the Nightmare runs into (out of?) Broad Creek, the upper stretch starts to close in. Mast down, too much canopy. And it gets narrow - oars in, start to scull (I paddled). But then it gets REAL narrow. Look through some of the video and photos posted over the years. My rowing shell had a 32" beam and was 18'. 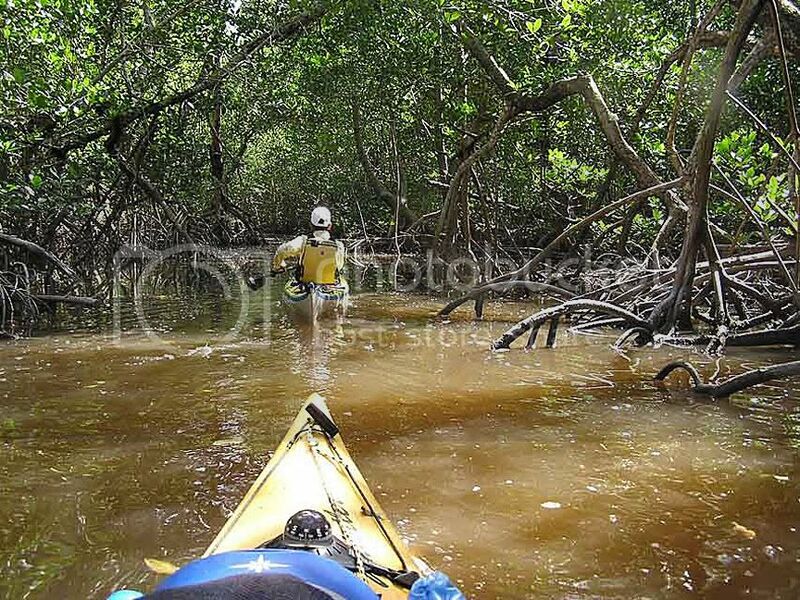 In places, I had to do 3-point turns to make it through mangrove roots, pulling myself along hand over fist. This is the part I do not know if your relatively wide and high craft (mine only needed 12" vertical, other than my hunched body) can squeeze through. Every year roots and branches need to be cut back so even slender kayaks can make it through. It is a jungle. If you make it through there, that is the end of any narrow stretches. If you need to turn back, just head out Broad Creek and sail on down and around. In my opinion, the part of the WW you will have traversed by then is well worth the extra day or so it might take, even if you do not get the alligator tooth. You would still get the shark's tooth for completing the EC, if you make it to Largo. And you will have had your fill of reptilian wildlife. But like DWM says, no matter what route you take, you will have plenty of adventures. Thanks, I always wondered why pure row boats were not common in the EC. Now I understand. Most sliders are 5' lock to lock. I'.m curious as to how the Hobie mini tris manage it? Can they fold the amas underway? Looking at the Nightmare video, I don't think I'd be able to get through it with out a saw, and my guess is that is not legal. Now long is it? If the stretch between the head of Broad Creek and the Harney River is similar as BeastOarman implies the problem would be the same. RANTAN's beam is 5', and that mainmast isa carbon 19 footer. Sculling works but in this boat you pretty much need to stand. I also often carry a push pole which can serve as a sprit boom for the main which can come in handy for pure marsh country. I'd hate to be forced outside; Whitewater bay looks amusing, much more amusing than sailing along and looking at beaches. I'm curious as to how the Hobie mini tris manage it? Can they fold the amas underway? I think only 1-2 Hobie Islands have done the WW. Yes, Islands can fold their amas in underway. Here is an image of one of our trips through nightmare. Nightmare from WW marker 124 to WW marker 121 is 3 mi and change. I seem to recall at least one Hobie towed ama's behind. Seabag, you might consider exiting at Broad River and then coming back in at Ponce de Leon Bay. This would let you experience the back country, plus Whitewater Bay, without that gnarly stretch. Much of the video from Macatawa is upper Broad Creek, I would guess at least the last half. No Gator tooth that way, but lots to experience.